Over 79,000 Visitors from 1997 to 9/27/03! Quinn (left), Ziggy (top), and Fair in my 50 gallon tank, 11/6/97. This page is for freshwater aquariums. I recently started my first saltwater aquarium. Go here for what little I have on saltwater aquariums. New! Go here to see a video of the 50 gallon tank! 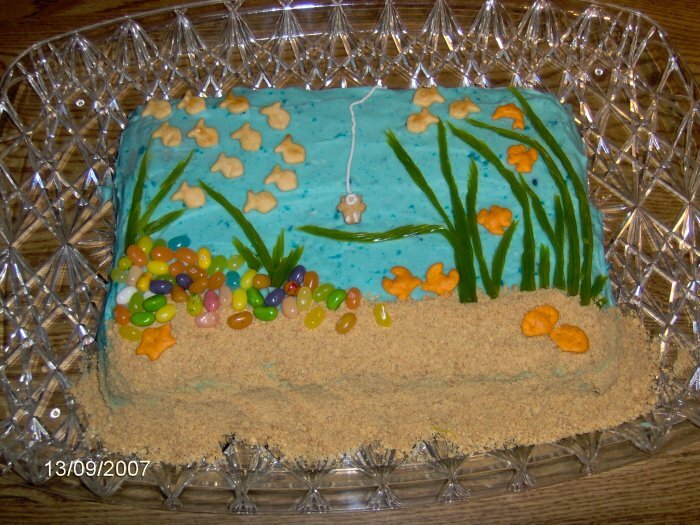 Photo of an Aquarium Cake that my mother made on 9/13/07 for my birthday. Acclimating Fish - Adding aquatic animals to your aquarium. Glossary of Terms - a list of some words relating to fish, ponds, etc. Tub Ponds - a great way to grow large, healthy fish and breed them easily is to put them in tub ponds over the summer. Books, Newsgroups, Catalogs, and Web Sites - links, FAQ's, big sites, personal sites, specific fish, web rings, message boards, and more! Information on descriptions, care, sexing, breeding, and more! Note that you should read all information under your fish of interest. Sometimes, something about one topic may be under more than one heading. Certain fish may even be discussed under other fish based on the interactions of both species together in my tanks. Go to the fish index for fish species lists by common name, scientific name, and family. Rosy Red Minnows and Fathead Minnows ( Pimephales promelas , mnd) - two large amazing pages! The Aquaria (two different ones) and Tropical Fishkeeping Web Rings can be accessed from my homepage. The Fishkeepers, Tropical Fish Jungle, Freshwater Aquarium Site, FishGeeks.com Aquaria, Glimmering Goldfish, and Ichthyophilia Web Rings are at the very bottom of this page so that if there is a problem with the Java code, it will not interfere with the rest of this page. There are supposed to be two rings below but for some reason, they will not come up anymore even though the code is here! This Breeding Tropical Fish SiteRing site owned by Robyn Rhudy. Owned by Robyn's Fishy Page and Hosted by RingSurf. Go to the these links to learn about these torture cells and what you can do to help. If you own one, the information will help you properly care for them. Vote for Robyn's Fishy Page at these three fish web sites! If you like my site, please click on the above images to register my site as a good fish site with Aquarank, Fishseekers, and Top Aquaria Sites. My native North American fish related pages won the following award in March of 2000. This site won the following award in September of 2000. 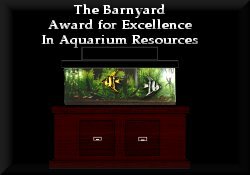 This site and my goldfish page got this award in April of 2004. Let other people know about Robyn's Fishy Page by clicking on the button below! This site used to have a counter at its old site. The final count from 1/14/99 to 9/27/03 was 55636. The server reset the counter on 9/25/00. The last recorded hits was 19148 on 9/1/00 since March of 1999. The server reset the counter sometime in early March of 1999 for an unknown reason. The last recorded count of visitors to this page was 4247 between 9/22/97 and 1/14/99. The visitors have multiplied greatly since then. Visit my new interactive page where you can add a link to your fishy page, fill in a funny aquarium story, and more! Do you have or want a pond? Then, visit my pond pages! AquariumGuys.com is your source for aquarium decor. Check out the great selection of aquarium driftwood and plastic aquarium plants available for your tank.